So far, I’ve read only one story in this wonderful book, Where An Angel’s On a Rope. Whether a short story, a novella, or a full-length novel, Mara Purl can grab and hold your attention until you reach the last page. She leaves you always wanting more. 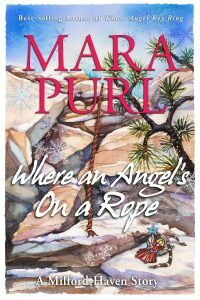 Mara can pack more meaning and emotion into a few pages than most authors can in 250, and Where An Angel’s On a Rope is no different. A wonderfully moving story and as I’ve come to expect, it leaves us to wonder what’s coming next, because obviously this story has not ended. I can’t wait to read the remaining stories. I treated myself to reading the first two of your Christmas stories – Where Angel’s On a Rope and When Angels Paint – and I REALLY love ’em! Your literary gifts just continue to amaze – yours is an ever expanding talent, and I was truly touched. Mara Purl’s story is beautifully told, with exquisite detail and gripping scenes that take you into the lives of these characters in a suspenseful and riveting way that will keep you reading rapidly to find out the ending. She has a wonderful way with words and images.